There are many different grades of ball screws (C0 though C10) which determine accuracy and repeatability. C0 through C5 are ground ball screws, where the screw is ground for precise channel depth for the ball nut ball bearings to ride in. The balls for the ball nut are precisely measured and fit into the ball nut so there is a high level of accuracy. These type of ball screw assemblies are typically used on precision measuring machines and not with CNC cutting systems. Then there are less precise ball screws, known as rolled (C7 through C10) ball screws. These are the cheapest ball screws because very little measuring is required and they have cumulative inaccuracies. An example of this is the average rolled ball screw has a position accuracy of +/-.002” over 12”, which means over 4feet this accuracy could be out +/- .008”. This is typically okay for CNC routers since they are cutting materials such as wood, plastic, foam or signage materials not requiring high precision cuts. Ball screws are commonly used on small machines that are less than 4 feet. As the screw gets longer, it introduces whip,which causes vibration that can resonate throughout the machine mechanics thus causing vibration in the cutand premature failure of the drive mechanics. In addition, this vibration affects the cut quality. This is why most of the industry, building large format CNC Routers, use helical rack and pinion. 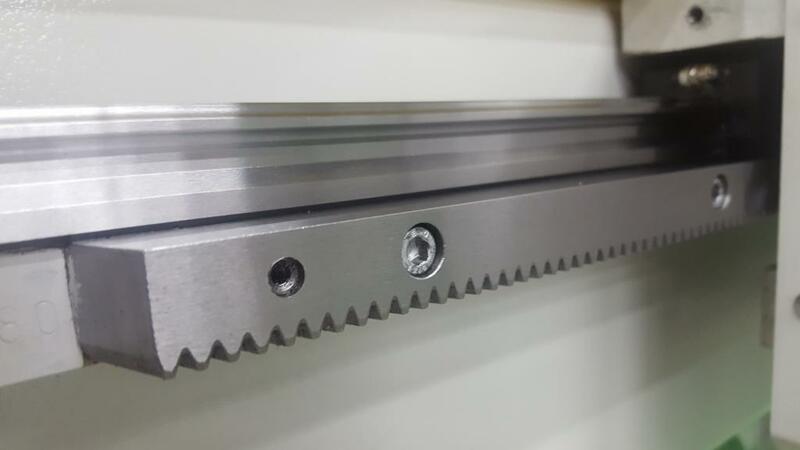 Helical rack and pinion is the choice of Techno CNC Systems large format builds. These racks are mounted to the precision machined surfaces of the steel frames. The helical racks used hold a positioning tolerance of +/-.002” per meter. In addition to the greater accuracy,this allows for greater speeds and accelerations. Because these are directly bolted to the steel, there is no vibration. In addition, Techno directly couples the drive pinion to the motor so that there are no other mechanics that can impede its performance. 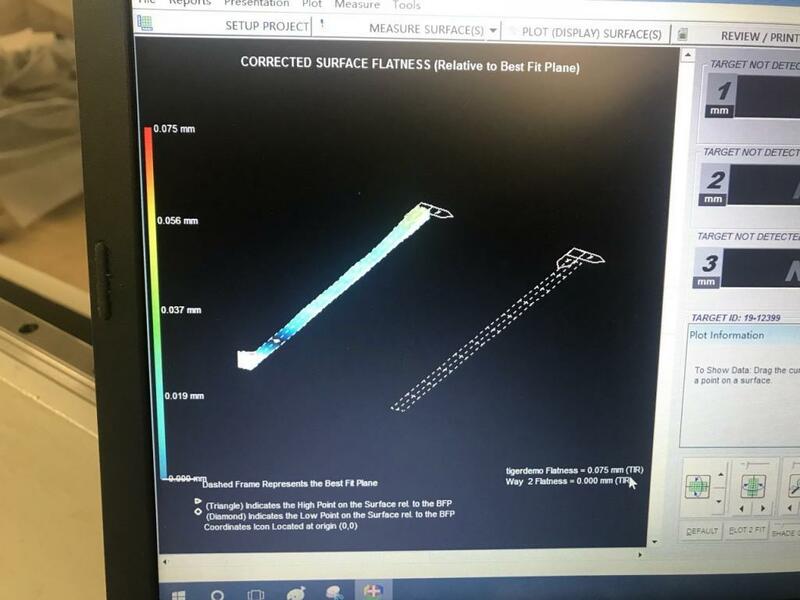 The two pictures above show how the THK linear rails and helical rack and pinion are laser aligned using state of the art software. This technology assures highest level of precision alignment for the system drives.